Exemplar-Based Knowledge Acquisition: A Unified Approach to Concept Representation, Classification, and Learning covers the fundamental issues in cognitive science and the technology for solving real problems. This text contains six chapters and begins with a description of the rationale for the design of Protos Approach, its construction and performance. The succeeding chapters discuss how the Protos approach meets the requirements of representing concepts, using them for classification, and acquiring them from available training. These chapters also deal with the design and implementation of Protos. These topics are followed by a presentation of examples of the application of Protos to audiology and evaluate its performance. 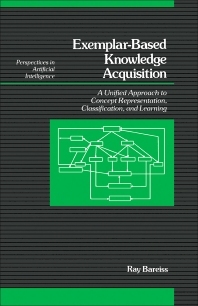 The final chapters survey related work in the areas of case-based reasoning and automated knowledge acquisition and the contributions of Protos approach. This book will be of great value to psychologists, psychiatrists, and researchers in the field of artificial intelligence.